Twitter Movies shared Tips for Live Tweeting during the event. 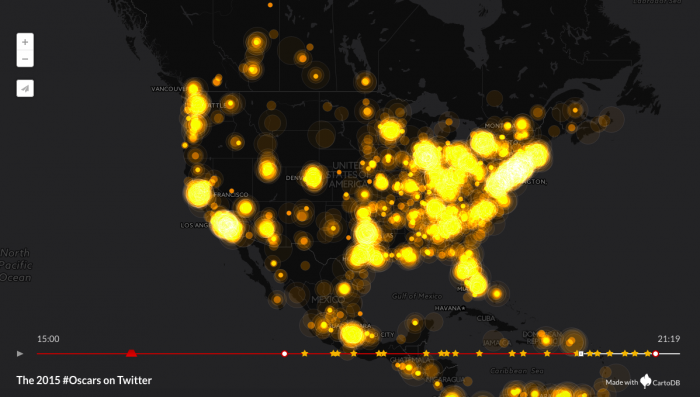 The event created significant buzz as can be seen from the heat-map below. Dove and Twitter co-promoted #speakbeautiful that has received over 6000 Retweets. Twitter and Instagram were the most influential channels for hashtag Oscars and the buzz exceeded 70 Million impressions across the Globe with Retweets being at 76 percent of all the buzz on Twitter. AT&T used Facebook Video by sponsoring the Music Moment at the Oscars. A Time-lapse shared by The Academy from GMA’s feed shows the crew building the event. Calvin Klein Built on the details with a Hashtag #CalvinKleinLive curated for events to promote the Live events. Burberry shared a Red Carpet look. Walt Disney Animation Studios posted Tweets about the Award Winning Films. Red Bull promoted a Tweet mentioning Oscars to promote the limited edition drinks. Posted in Advertising, Creative, Digital, Facebook, Real-time Marketing, Social Media. Tagged AT&T, Campaign, Digital, Facebook, Social Media, Twitter.